It is the new season at the Paris Opera House, with a production of Gounod’s Faust. Comte Philippe de Chagny and his brother, the Vicomte Raoul de Chagny, are in attendance, Raoul attending only in the hope of hearing his sweetheart Christine Daaé, whom he wants to resign and marry, sing. At the height of what soon becomes the most prosperous season in the Opera’s history, the management suddenly resign. As they leave, they tell the new managers about the Opera Ghost, who sometimes sits in Box 5, and leave troubled. After the next performance, the ballet girls are disturbed by the sight of a mysterious man in a fez who dwells in the cellars. Arguing whether or not he is the Phantom, they decide to ask Joseph Buquet, a stagehand who has actually seen the ghost’s face. Buquet describes a ghastly sight of a living skeleton to the girls, who are then startled by a shadow cast on the wall…. Any reader who knows their classic horror will probably wonder why it’s taken me up to now to do a review of the first, and best, version of Gaston Leroux’s oft-adapted tale, considering that I reviewed the inferior [though still good] Claude Rains remake a while back. All I can say is that it’s sometime daunting to review a film that so many esteemed critics have studied [I’m dreading getting to Vertigo and Psycho in my series of Hitchcock reviews! ], plus I realised that the copy I had was not only of poor quality but not the original version [more on this later]. Though they are a bit of an acquired taste, and one really has to be in the mood to see one, watching a great silent movie, especially of the horror kind [though in 1925 the term horror film wasn’t in use yet, that wouldn’t happen until 1931 and the early Universal sound classics like Dracula and Frankenstein], like this can be a really thrilling experience, partly because you’re watching things that have been done to death subsequently, and have become staples, being done for the first time. You’re virtually seeing the horror movie being invented before your very eyes. 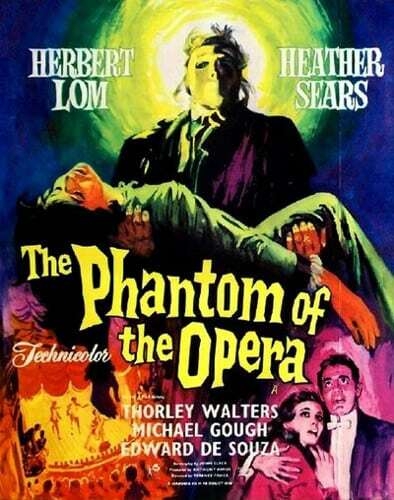 Of course you don’t hear any dialogue, and the performances are often exaggerated, but in an overwrought Gothic melodrama like The Phantom Of The Opera, it seems entirely appropriate. This film is actually a little uneven and, while its best moments are amongst the most memorable in horror cinema, one can sometimes see evidence of its extremely troubled production. In fact, it’s amazing that it resulted in a watchable movie at all. Universal head Carl Laemmle read the book in one night and bought the film rights as a vehicle for star Lon Chaney, fresh off his success as The Hunchback Of Notre Dame and already becoming known as the ‘Man Of A Thousand Faces’. Production started in late 1924 and did not go smoothly, director Rupert Julian falling out with most of the cast and crew. Chaney shot some scenes himself. Previews went badly, and Julian refused to do reshoots, so Edward Sedgwick was hired to film new scenes written by Raymond L. Schrock and original screenwriter Elliot Clawson. Much of the darker material was removed, and the film was changed into more of a romantic comedy with some comedy relief and an extra suitor for Christine. It also got a more action-packed ending. This cut had an even worse reception, so Maurice Pivar and Lois Weber were asked to do a huge re-edit of the film, removing most of the Sedgwick material [though keeping the ending] and reinserting most, though not all, of the Julian footage. One notable Julian scene, with Christine at her father’s grave and the Phantom playing a violin, was cut at the last moment and some press stills were taken from it. The scene, slightly altered, later found its way into Andrew Lloyd Weber’s stage musical. While the critics were divided, some finding the film just too horrible, it was a hit, despite reports of people fainting during the un-masking scene, and its success paved the way for the Universal horror pictures of the 30’s. However, the story doesn’t end there, and I don’t want to take up too much time with this, but it’s important to know that there are two very distinct versions of this film. This is because in 1929 Universal, cashing in like most studios did at the time on the new sound craze, heavily re-edited the picture and made it into a partially sound film. The opera and masquerade scenes were re-shot and expanded, but 25 mins were cut elsewhere. This version, for which the soundtrack is lost, moves at a faster pace than the earlier cut, but certain notable elements, like Christine being tutored by the ‘Spirit Of Music’, and the cop in disguise who is after the Phantom, are truncated to the point of making little sense, and for my money it’s nicer to have a slower build-up to the exciting scenes. The downfall of this version is that it only survives in poorer quality prints, though the only reason it exists at all is that it made its way to TV before Universal, in an appalling example of misjudgement, melted down most of their silent films. I still prefer the 1925 version, though I’m surprised they haven’t put out a version that combines the best of both worlds, with all the 1925 footage but containing the extra bits and pieces from the 1929 one. The thing that most surprised me whilst watching this film [which I hadn’t seen for ages] is how much Webber took from it. I have no shame in admitting I’m a fan of the musical too and some scenes in the 1925 film are so similar that there were times I couldn’t stop imagining the songs coming out of people’s mouths. Sadly Webber toned down the character of the Phantom, whose actual name is Erik, not to mention having him only partially disfigured. Chaney’s Phantom remains a monster through and through, and, while we do feel very sorry for him, he remains frightening. Webber’s Phantom is only mildly scary in the early scenes and is generally sympathetic throughout. This obviously helped made the musical so successful and in fact most other film versions of the story have also made the Phantom a character whom you’re partially ‘behind’, missing the complexity of the 1925 Phantom. It’s far braver, and more interesting, when the Phantom is mad, frightening and looks damn hideous [the worst part of the musical is when he’s unmasked and shown to have a case of bad acne on one side of his face], and yet some sympathy for the fiend creeps in. The performance of Chaney helps immensely. People go on about his make-up, and I may do the same in a minute, but Chaney also contributes an amazingly physical performance that is interesting to just sit back and watch, independent of everything else – just look at the graceful, yet creepy, way he almost constantly moves his hands. Of course this style of acting would look daft in most modern films, but so what? I’ve read reviews of this film which say that the early scenes are dull, and I suppose a few of them are, but I certainly don’t think the story moves slowly. There’s no doubt that the direction varies in quality, something understandable given it was the work of several people, and that Julian, whose work takes up more of the film than anybody else’s, was more interested in some scenes than others. The early sequences that are set backstage still have a wonderful mock terror quality – you may be chuckling a little, but you will find it easy to put yourself in the position of a 1925 viewer who wouldn’t be familiar with this kind of thing on the screen. Ballet dancers flee from shadows, bodies are found [there’s a great: “He’s behind you” moment where a stagehand takes a while to notice the corpse swinging in shadow behind him], and not one but two mysterious men seem to be lurking around. There’s some fun character acting, especially from Snitz Edwards as Florine Papillin, who provides a bit of comedy, but not too much. 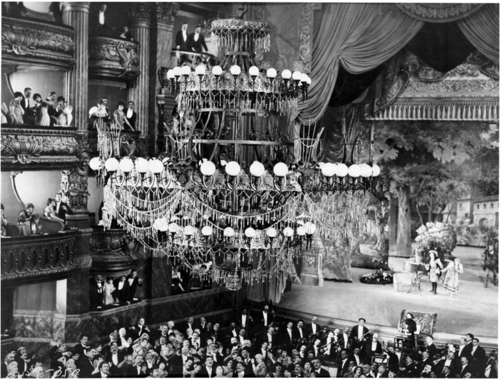 The opera performing, at least in the original cut, is nice and brief, if very statically shot, and the Paris Opera House set very impressive. Part of the set still exists and is reputed to be haunted by Chaney’s ghost. The famous scene where the Phantom causes a chandelier to fall on the audience is a bit disappointing. The 1943 remake did it far better. The build-up is too short, the actual scene appears to have a shot missing where it hits the ground, and it then fades out all too quickly, though at least it you can tell it was an actual chandelier they cut down! In any case, we now get to where the film really takes flight and only occasionally takes a misstep. The production design of Ben Carre, who actually did work at the Paris Opera House for a while, really shines as the film moves into wonderful Gothic dreamy mode. Erik takes Christine to his underground lair, and it seems to take forever as he leads her down loads of flights of stairs, by horse, and then on a barge on what looks like the river Styx. You can see Bava, Corman, even Burton just in this single amazing scene in a film which has been imitated over and over again. While visually The Phantom Of The Opera is never as striking as most of the German Expressionist silent movies like Nosferatu, and the direction and photography rarely as imaginative, the design is stunning through – just check out the ornate bed Erik seems to have purchased for the precise purpose of letting Christine sleep in it [it was later used in Sunset Boulevard]. Now we get to the un-masking, and it has a great lead-in as Christine sneaks up behind the organ-playing Phantom [the inspiration for countless scenes of organ-playing villains from Captain Nemo to Dr Phibes] and has second thoughts for a few seconds about what she intends to do. When she eventually removes the mask, we see the Phantom’s face but she does not, because his back is turned to her. He turns away from the camera and we feel an extra twinge of dread, because we know the horrible sight that is about to greet her eyes. When she does finally see him, the film cuts back and forth from her horrified face and the horrid visage of Erik, some of the latter shots slightly out-of-focus shots implying she is light-headed with fear. 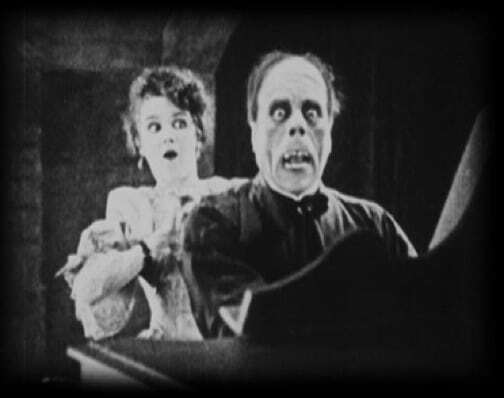 Actress Mary Philbin’s reaction was real, as she hadn’t seen Chaney’s make-up yet. He painted his eye sockets black, giving a skull-like impression to them, pulled the tip of his nose up and pinned it in place with wire, enlarged his nostrils with black paint, and put a set of jagged false teeth into his mouth to complete the ghastly deformed look of the Phantom, whose appearance is very close to the descriptions in the novel, which this film does follow quite closely until near the end. 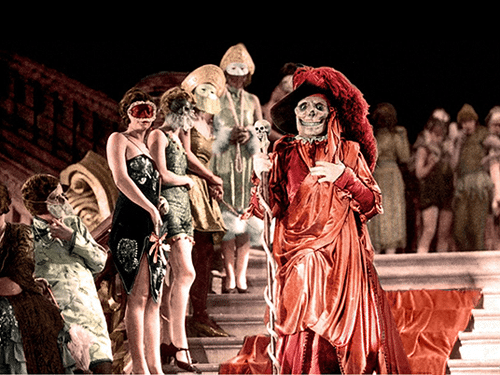 Straight after this [the middle section really is the best], we have another memorable bit where Erik interrupts a masked ball dressed as the grim reaper, a scene shot in colour though only existing now in that form in the 1929 re-cut, and then another great one when the Phantom sits atop a statue, his cloak billowing in the wind as he looks down on to Christine and Raoul. Of course we don’t care too much about these two and it’s right that we shouldn’t. While making good use of some torture chambers that supposedly exist beneath the Paris Opera House, the film becomes more of a serial-type thriller and the climactic chase seems out of place, though it’s well shot with some good cutting towards the end, and introduces what would be another staple of Universal’s horror movies: the use of mob law. 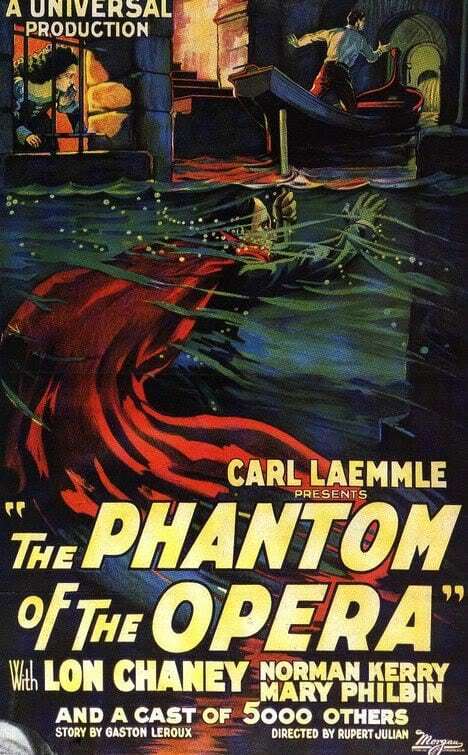 The Phantom Of The Opera is in some ways quite flawed [if understandably so, given that it was basically cobbled together], but it has true brilliance in it throughout. Another superb moment I haven’t yet mentioned is when two people are behind an open door and a face starts to slowly loom out of the darkness. In scenes like this, the film seems to get closer than many others to the emotional essence of the whole horror genre. 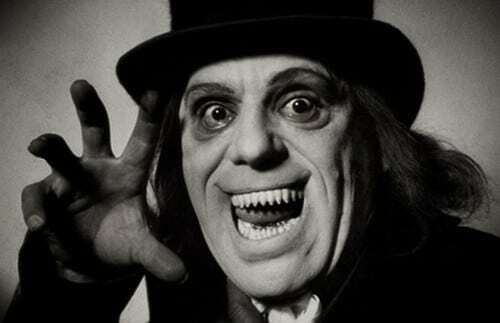 HAS PRINT OF RARE LON CHANEY HORROR ‘LONDON AFTER MIDNIGHT’ FINALLY BEEN FOUND? Great classic, would love to win.